Paul Jackson Pollock (28 January, 1912, Cody, USA — 11 August 1956, Springs, USA) is an American painter, who become known for his abstract expressionist paintings in the early 1940s. Pollock had difficult, peevish character and suffered from alcoholism. He settled in New York in 1930, got acquainted with many cultural figures, including Peggy Guggenheim, who made him her protégé. 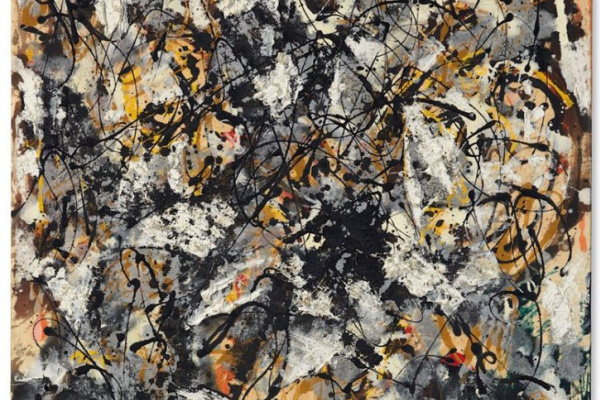 In the mid-40s, Pollock and his wife moved to Long Island, where he painted pictures; the works made after the movement brought him wealth and world renown. 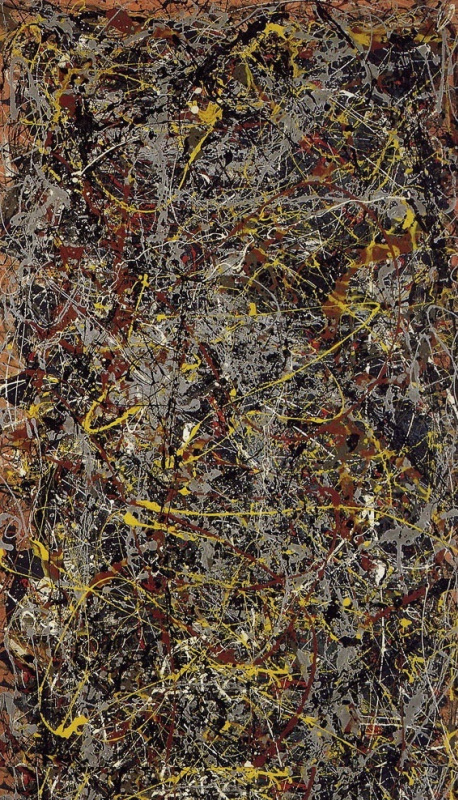 Creative features of the artist Jackson Pollock: In the late 1940s, Pollock began to work in a unique "drip" technique (also called "spattering"). He placed the canvas on the floor and moved around it, pouring and spattering the paint with brushes and improvised objects. 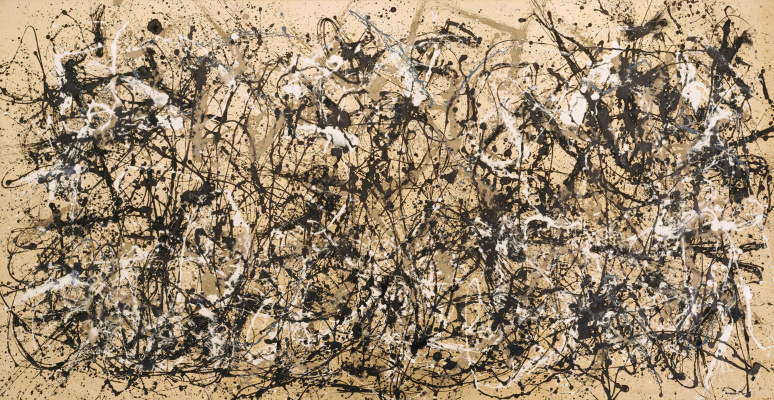 Famous paintings by Jackson Pollock (follow the links to see photos): Number 5, Autumn Rhythm, Mural, The Deep, Blue Poles. "Every good artist paints what he is," Pollock once said. If you look at his canvases with this statement in mind, it becomes obvious that his soul was total chaos. However, it is worth looking at Pollock’s paintings more closely — and this chaos would already seem inconceivably ordered and harmonious. 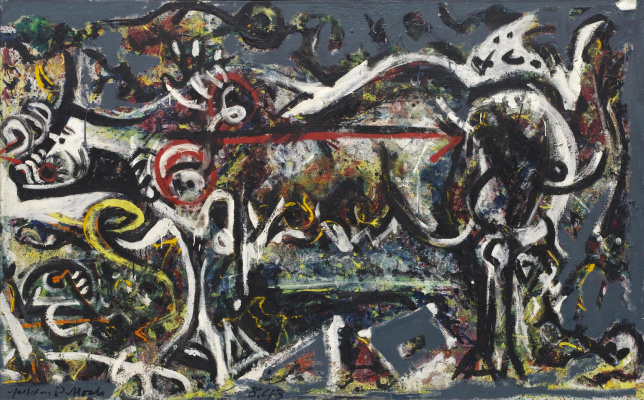 The early abstract expressionist style, characteristic for the most known art by Jackson Pollock, was born after the Second World War and became an anarchist, rebellious and even nihilistic insurgency. 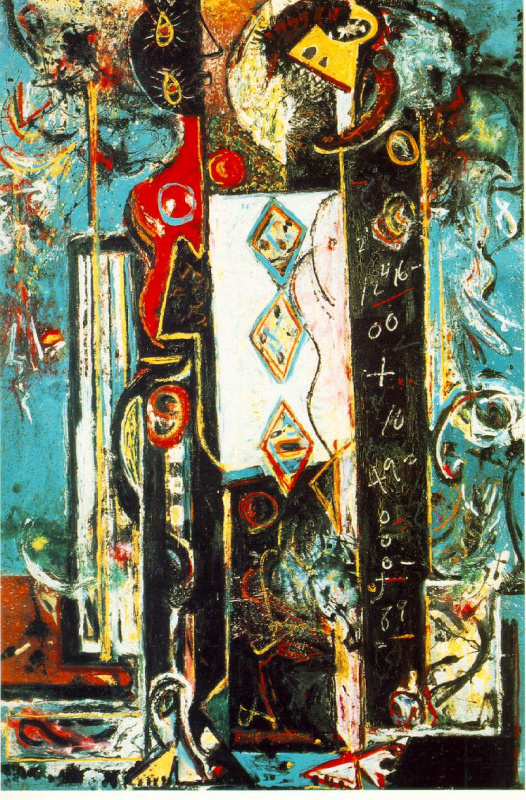 The ground-breaking technique of paint spattering invented by Pollock (in his previous early works, the influence of Mexicans Diego Rivera and José Clemente Orozco was noticeable) inspired many of his contemporaries and followers to reject canons of fine arts, cross the line (often beyond the pale) and express their artistic vision in unexpected ways. Famous painters are forgiven a lot. 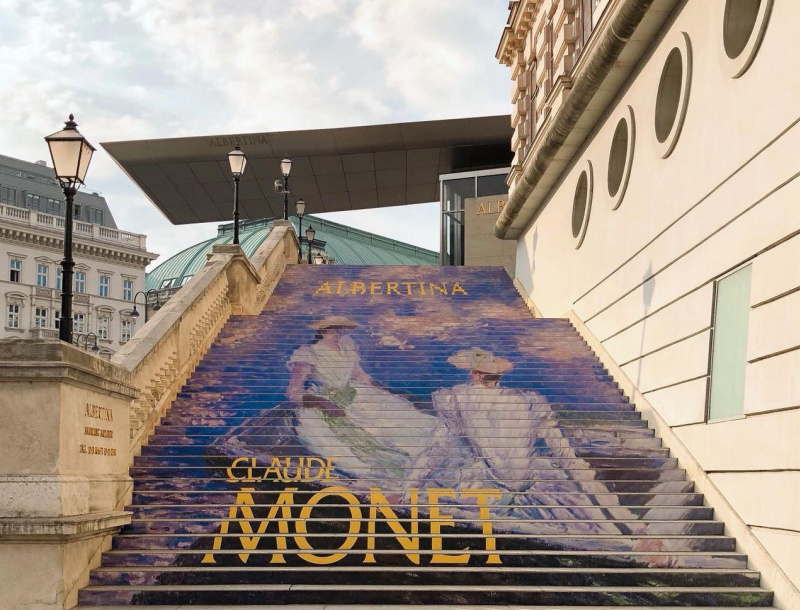 Their painting talent turns them into a separate caste, which have no human weaknesses a priori, and if they do, the public turns a blind eye to them with a lenient smile. However, Jackson Pollock, despite his creative abilities, was still the most ordinary person. And, for that matter, he was far from being the most pleasant. Gloomy and unsociable oddity, always depressive and addicted to alcohol, he did not have backbone for action. Cigarette and bottle were constant Pollock’s companions; he was the bane of his relatives, raised hell and started drunken brawls, and often remained with no money. A terrible, but spectacular finishing touch in the painter’s being was the car accident that killed 44-year-old Pollock, who fairly lifted the elbow before driving, and one of his passengers. Jackson Pollock left dozens of paintings, many of them painted his unique "drip" technique, and the house in Long Island, where most of these paintings were born, later turned into a museum. He also left two of his beloved women. His mistress Ruth Kligman was the only survivor of the accident and made a name for herself by publishing the memoir about her affair with Pollock. And his wife Lee Krasner, perhaps, can be called survivor after 15 years of relationship with Jackson. Jackson and Lee first met at a party in 1936. But Pollock hardly remembered their meeting as he was drunk as a skunk. At the age of 24, the young painter was already an alcoholic. Jackson, the fifth and youngest son of Stella May McClure and LeRoy Pollock has never gotten along with people. Withdrawn and unsociable, prone to bursts of anger, the boy twice dropped out of school because of constant quarrels and fights. Constant travel of the family, who were looking for a better life and job all over America, the despotic mother, who was bearing the burden of raising five boys, and rare meetings with his father, who worked round-the-clock, had left traces upon his character. All of this, after all, led to the fact that by the time of moving to New York in 1930, 18-year-old Jackson has become alcohol addicted too early. In 1941, Jackson Pollock and Lee Krasner met each other officially. It is hard to tell what a young independent woman, who undoubtedly had a great experience and knowledge in the art, saw in a grim alcoholic, who played the role of a frivolous cowboy. However, Lee later confessed that she fell in love with him instantly. After a while, they moved in together, and Krasner became the main fan of Pollock’s creation, his guardian and secretary for many years. 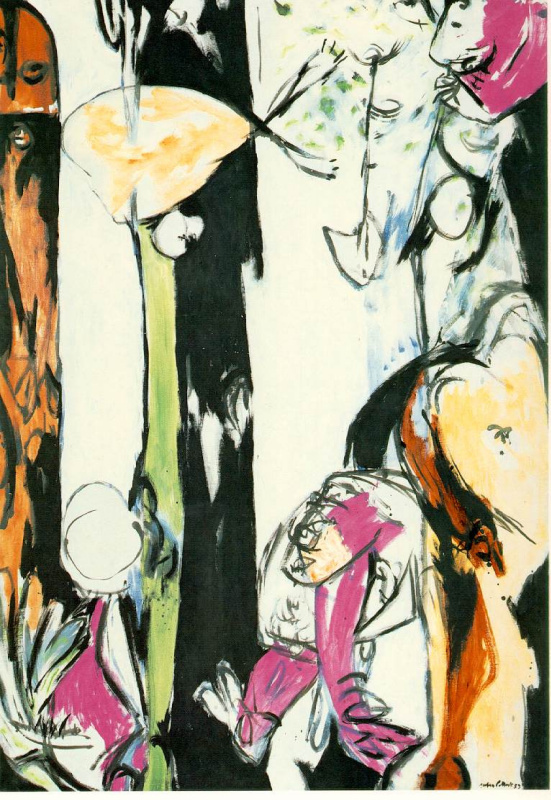 Thanks to her, the artist met many representatives of the creative elite of New York, including the famous art collector Peggy Guggenheim, who was the first to present the picture by Pollock to the public in the gallery (Stenographic Figure, 1943); she also ordered him a large canvas for her house and organized him several personal exhibitions. Despite the fact that critics and the public expressed appreciation for the works of Pollock, nobody rushed to buy them. Jackson changed several agents, but none of them could make any progress. This continued until the painter invented the personal "drip" technique, which brought him the world fame. Before that, Pollock was in constant need of money, and at the end of the year, under the contract, all his unsold paintings became the property of Peggy Guggenheim. In 1945, Jackson and Lee got married and decided to leave New York. They moved to a small house in Springs on Long Island. The artist set up a studio for himself in a shed, where he worked until his death. Studio of Krasner was located in one of the rooms in the house, but after the death of Pollock, she moved her studio to the same shed. After his moving from New York, Jackson almost quit drinking, and the existence without eternal parties and drinking buddies was a lot of good for the painter and his art. He made no movements towards the bottle for two years. During these years, Jackson began to paint more, honing and improving his technique right along. He did not make sketches, nor did he install canvases on an easel, and later he even put aside his brushes and preferred using only improvised means to create a picture of expressionism. Pollock would rather nail the canvas to the wall or spread it on the floor: "On the floor I am more at ease. I feel nearer, more a part of the painting, since this way I can walk around it, work from the four sides and literally be in the painting." 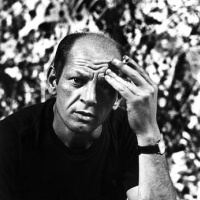 Journalists and art commentators still often trifle with the truth, trying to present Pollock as a unique painter, claiming that he invented the "drip" technique almost accidentally. In fact, it was his long experiments which resulted in a new way of drawing. He began to work, spreading canvases exclusively on the floor, he diluted the paint so it could freely stream on a canvas, and depending on its body, it either absorbed or solidified on the surface in a form of volumetric spatters. 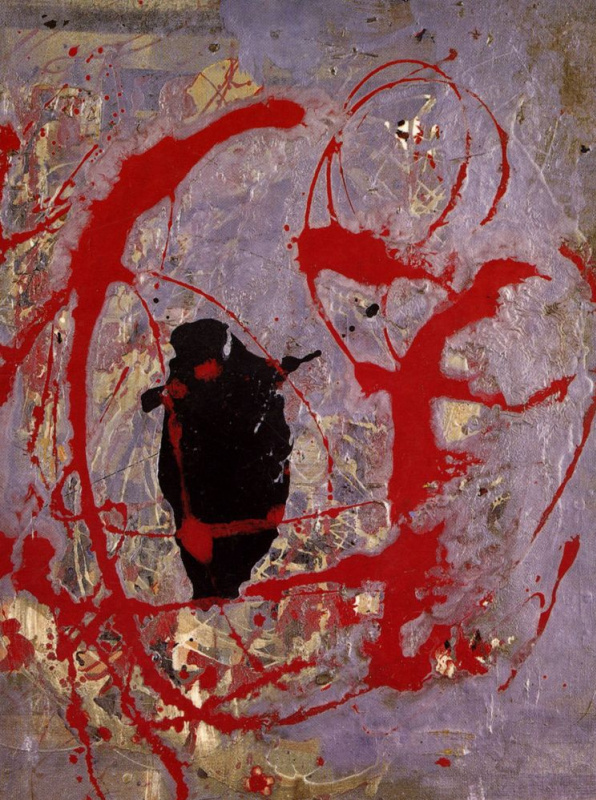 According to eyewitnesses, Pollock made movements around the canvas, like in a dance, pouring the paint straight out of the jar and spattering it, using not only his hands for this action, but all his body to create his art of expressionism. Kurt Vonnegut wrote in the article for the "Esquire" magazine about Jackson Pollock and his artworks, "Pollock just mucked about with his sprinklers and spatulas, covering the canvas with paint, spending all his time and money on this, besides, nobody advised to him or induced to anything, he was just amazed, with an interest of a child, if something amusing would happen." Unlike many art people, Pollock did not need doping to paint. Alcohol was only an obstacle in his work in the art. Maybe that’s why two years of total sobriety became the most productive for Jackson. It was the period when he created his famous paintings Number 5 (1948), Autumn Rhythm (1950), Lavender Mist (1950), follow the links to see the photos. 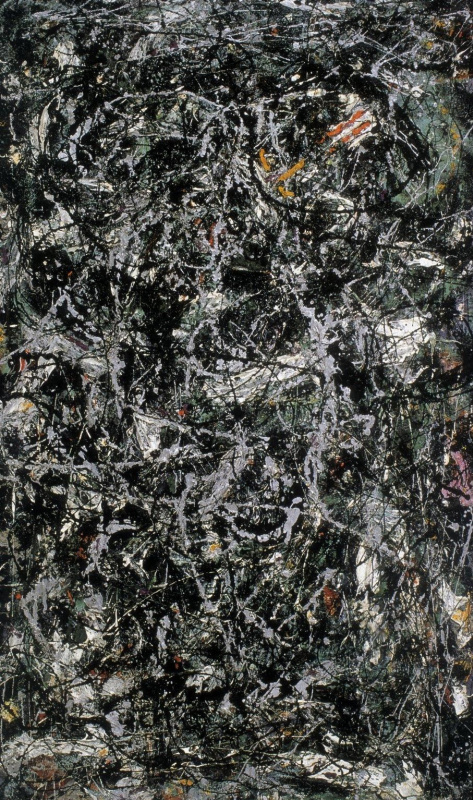 The technique invented by Pollock became a real sensation. By 1952, his paintings were finally sold well in the galleries, largely due to the competent approach of the agent Sidney Janice. At the same time, Jackson returned to drinking and to his normal routine. 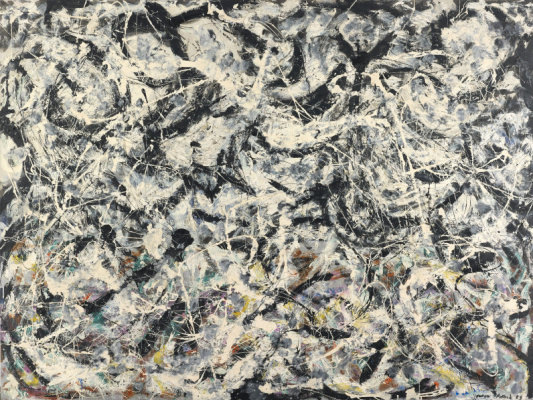 Every year Pollock painted ever less, but still he managed to create several stunning artworks: frightening Blue Poles (1952), dizzying Convergence (1952) and fascinating The Deep (1953). Despite all the efforts of Lee Krasner, Jackson continued to drown in depression, and alcohol made the situation worse. Their marriage began to crumble into pieces, and the last Pollock’s attempt either to ruin or to fix his life finally became an affair with a young artist Ruth Kligman. Anyway, nothing good came from this relationship. Krasner left Pollock and travelled to Europe. He began to harass his new lover, who could hardly tolerate his drunken tricks. On 11 August 1956, Jackson picked up the bottle for the last time. The car with him, Ruth and her friend Edith crashed into a tree at high speed and turned over. The fact that Kligman was thrown out of the car saved her life. Everyone who was close to Jackson Pollock agreed that his entire biography was a struggle against his own demons. Perhaps, they’ve finally triumphed. Or maybe a deadly car accident was the only opportunity for Pollock to win them.